Are you being observed by an administrator or a colleague? Show off your best teaching attributes by planning your lesson with this authentic sample and editable template. We gathered input from teachers at different points in their journey, university supervisors and administrators to create this useful resource. The plan shown here, was presented to a Spanish second year class using Realidades. Click HERE to see the resource. However, this is a generic plan that will facilitate a smooth, stress free and successful evaluated lesson in a secondary setting. A Teacher to Teacher page introducing the 8.5 x 11 printable slides in portrait format. 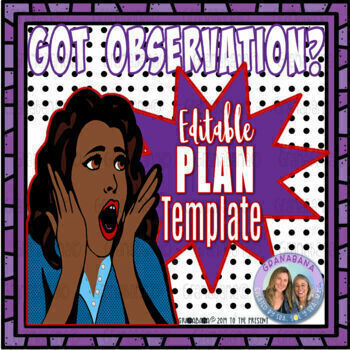 A 2-sided authentic sample of an observation lesson plan which was submitted to and approved by an administrator prior to a scheduled observation. 2 slides with embedded background images of the plan above for you to add your own information by inserting text boxes. 3 pages of administrative notes regarding the above plan and observation. 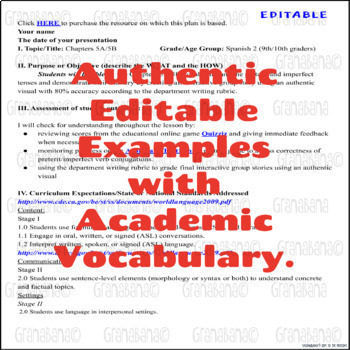 A link to the 2 slides fully editable Google Slides™ of the authentic sample for you to manipulate, format and complete as you wish. Helpful reminders to help get you prepared days before the actual observation. A visual of how to organize the documents your evaluator will need to have on hand the day of the observation. Praise words and phrases to begin using today to encourage your students' positive work, behavior and collegiality. 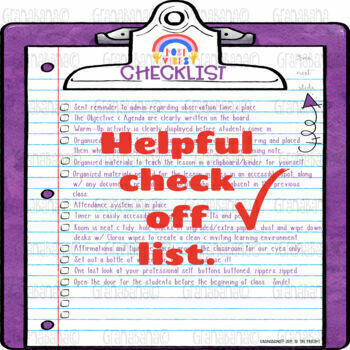 A last minute check list of what needs to be done prior to the observation. Affirmations for you to place around the classroom for your win!